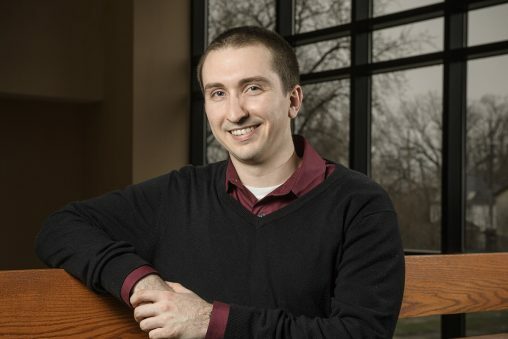 It was while working with children with autism at a clinic in Columbus, Ohio, that became a life-changing moment for Joshua Sensenbaugh, a student at Wright State University’s School of Professional Psychology. Sensenbaugh’s career interest suddenly veered to pediatric neuropsychology, which deals with how the brain affects behavior in children and impacts different disorders. “I’m really interested in working with neurodevelopmental disorders like learning disabilities, autism spectrum disorder, ADHD, fetal alcohol spectrum disorder,” he said. Sensenbaugh was recently elected vice president of Students in Pediatric Neuropsychology, a national organization overseen by the American Academy of Pediatric Neuropsychology. “I actually didn’t think I had a chance of getting the position,” he said. The academy’s mission is to advocate for the rights and appropriate assessment, education and treatment of children and adolescents; advance training and education in pediatric neuropsychology; support examination of competence in the field; and establish collaborative relationships with other professional organizations. Sensenbaugh’s duties in the year-long term with the student organization include helping organize meetings, writing newsletters, recruiting new members and developing mentorship opportunities. Sensenbaugh graduated from Miamisburg High School in 2013 as valedictorian of his class. A first-generation college student, he attended The Ohio State University in hopes of becoming a neurologist. But he soon transferred to Wright State and earned his bachelor’s degree in psychology with a concentration in behavioral neuroscience and minor in business in 2017. He was then accepted into the School of Professional Psychology and is pursuing his Psy.D. After graduation, Sensenbaugh would like to do postdoctoral work in pediatric neuropsychology, become a board-certified neuropsychologist and eventually work in private practice.